Fortunately for Wilson’s wife, who was in Knoxville, Tennessee with family at the time, she never took a hold of that door knob. Her stepfather, Jon Flositz, became suspicious after she told him Wilson had warned her not to let a child touch it. Flositz went to examine the house with his wife, Alissa, and they found the word “Hi” and a drawing of two eyes in what appeared to be lipstick on the back sliding door, according to the deputy’s report. He contacted authorities, and when they responded to 110 White Hall Drive on Tuesday, they found the front door was barricaded and locked. Burn marks were seen near the door’s handle. A kick to the door sent off a large spark. 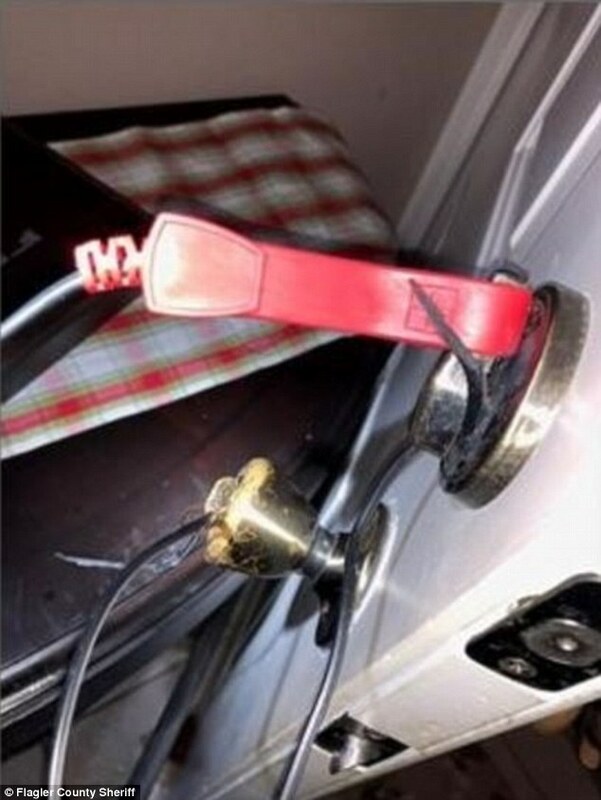 On the other side was an elaborate rigging consisting of two chairs, a child’s high chair, blue tape, a shower-type rod, electrical cords, wiring — some of which was cut from a bedroom salt rock lamp — and a car battery charger with clamps. Steven Bray, a journeyman lineman from from Florida Power & Light, was shown several photographs of what deputies described as the “booby trap” and he said that a person who touched the door lock and handle at the same time would receive a jolt of some 120 volts and 1 amp, enough power that the person had an 80 to 100 percent chance of “suffering death or great bodily harm,” according to the affidavit. Wilson is charged with two counts of attempted aggravated battery on a pregnant person and one count of grand theft of a firearm. 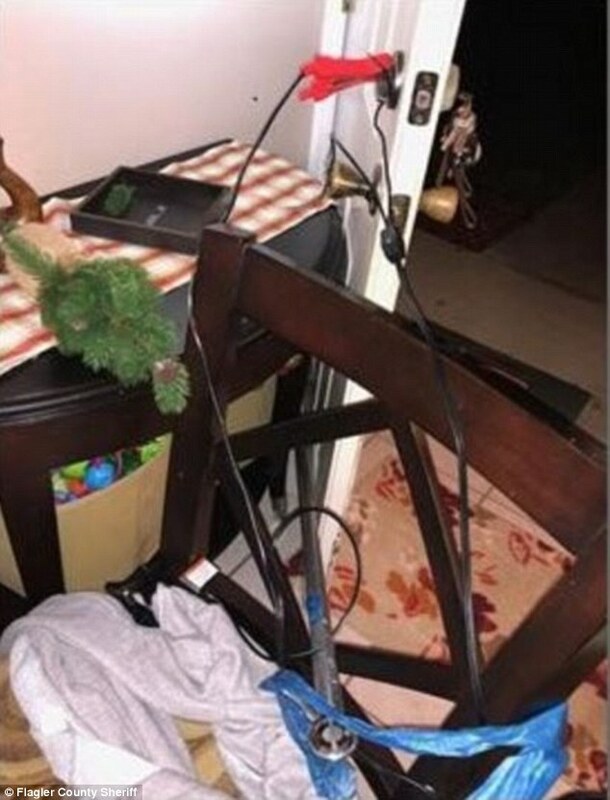 In addition to the electric rigging, deputies found a series of strange items within the house: pictures of a sonogram on the kitchen table, sticky-note love letters in the bedroom with a photo album showing Wilson and his wife together, and the wife’s recently-installed smart cameras dumped in the toilet. An interview with Wilson’s wife, whose name is redacted throughout the report, shed light on the scene. She said that a few months ago her husband fell but he refused to seek medical treatment. “Up until that point, (Wilson) seemed to be a normal person,” she told the detective. He was later hospitalized under Florida’s Baker Act — which allows for someone to be involuntarily taken into custody for mental evaluation — in late November. 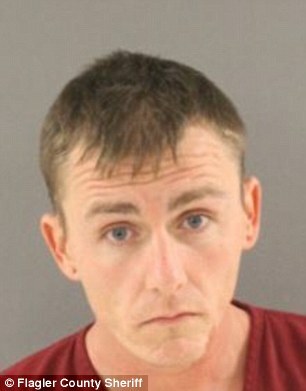 While he was absent she obtained a revolver from her stepfather, which she hid in a kitchen cabinet, and installed two smart cameras that sent video feeds to her phone. Wilson eventually apologized for his behavior and she asked him to join her in Knoxville where she was spending the holiday with her family and her children. He arrived there on Dec. 21. The next evening, however, he suddenly got up while they were watching television around midnight and left. In the morning she began to receive text messages from Wilson, who insisted that she was cheating on him. She told her stepfather about the comments and he checked the home before she returned to Florida. Wilson was arrested on a warrant at 12:30 p.m. Thursday in Knoxville. He was being held Friday on $150,000 bail and will be extradited to the Flagler County Detention Facility.